Fitmap is listing website for personal trainers and Gym/fitness clubs. Personal trainers (PT) & Gym/fitness club can register & manage their profiles. They can also list some offers deal/offers that customers can purchase offers from website. 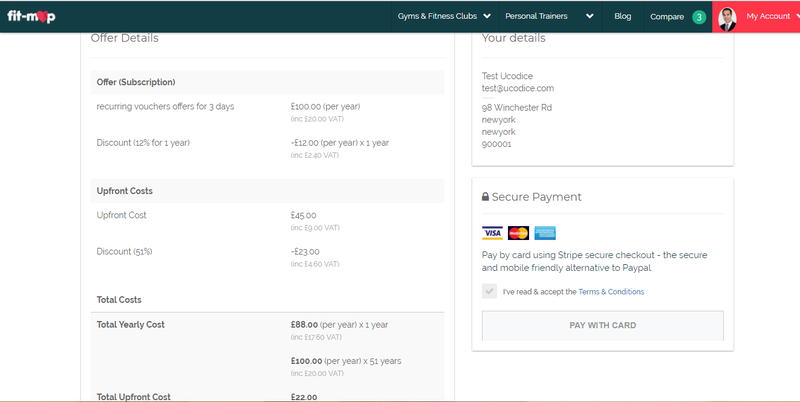 Customers can view listing of trainers, gym and search the gym or trainers location wise etc. They can also compare them. Customers can view blog & read articles. Vender can also. They will have option to view offers, purchase them & give feedback also. Admin will be responsible for managing things in website. a) Find Locals Gym :- Map listing page open.The Map Listing pages are used to display Profiles on a Map. Here user can able to search the nearest gym from his location and also navigate to see the details gym profile. b) Day Passes Offer:- User can view all the offer for gym and navigation for the payment for offer(payment only done by login user). The User can filter the offers by different criteria as per the Offer Listing page. The Offer Listing page lists all Offers currently created within Fit-Map by vendor. There are various pieces of functionality required such as Filters, Sorting and Pagination. Pagination limit are 10 per page. There must also be the functionality to pass Filters into the URL query string for the page to pre-apply filters which will pre-filter the results on pageload.These should be treated as specific pages. The Order Summary Page summarises the Offer Purcahse details and includes a Stripe Checkout. There are a few calculated fields here(i.e Total Offer Cost).There are various states to this page depending if the User is logged in or not which is detailed out on the following pages. a)Logged In user:- Suppose user is logged in they can directly checkout and make payment then it moves to order confirmation page. - Exsiting Customer :- If user have an account and they didn't loggin then from here user can loggin in into the website direct without go to the loggin in page. After login then can make payment then it moves to order confirmation page. - Your Details :- If user haven't an account then “Your Details” form help to create an new account direct here without go to the Create account in page. After login then can make payment then it moves to order confirmation page. The Order Confirmation Page is shown on successful Order placing, including Payment being taken via Stripe and the Order being added to the Database.The payment Successful panel must be shown and the Order ID presented to the User. The Blog Listing Page is used to list all the latest Blog Posts with a max of 10 being shown at once with the rest via Pagination. A sidebar is used to list Blog Categories, Archives, a Newsletter sign up widget and some banners which has been uploaded by admin. The User can add a Profile to the Compare function from the Map Listing Pages.A maximum of three Profiles can be added at any one time to compare. User can see company Terms and Condition details by this section which should be edited by Admin. The My Account Overview page is the landing page when customer creates an account and logs into the website. The Manage Orders page allows the Customer to view all his placed Orders. The My Account Overview page is the landing page when vendor creates an account and logs into the website. • Orders (including Orders placed via their Offers). The Manage Profiles page allows the Vendor type User to look at all the Profiles under their Account. Vendor can able to Add new profile and Edit old profile. Searching fuction is placed to search profile by the title. The Manage Offer page allows the Vendor type User to look at all the Offers under their Account.Vendor can able to Add new offer and Edit old offer. Searching fuction is placed to search Offer by the title. The Manage Orders page allow the Vendor to View their own placed Orders and their Customer place Orders on his created one. The My Account Overview page is the landing page when creates an account and logs into the website. The Manage Profiles page allows the Admin to look at all the Profile in the Fit-Map website. Admin can also create or edit the profile and under the any vendor user. Searching fuction is placed to search profile by the title. The Manage Offer page Admin to view all the Offers in the Fit-Map website. The Manage Orders page allow the Admin can see all Orders placed via Fit-Map. The manage Users page returns all current Users and allows the Admin to manage them or create a new User or edit a existing User details. The Manage Message page allows Admin to edit and update the messages shown to Customers and Vendors in the My Account Header section.Admin types in the message field box and clicks ”SAVE” button. The Current message should pre-populate the field. The Manage Blog page returns all current Blog Posts and allows the Admin to manage them or create a new Blog Post. Admin to Search the blog with title name if page not found any record then display no record related to this. The manage Facilities page returns all current Facilities and allowst he Admin to manage them or create a new Facility. There Per Page,Sorting functions and Facility Search function. The manage Reviews page returns all current Reviews and allows the Admin to manage them or awaiting status can be changed into live status. The manage Pages page returns all the Admin editable Pages in the fitmap website. All dynamic page details can be handle my Admin.